We were asked to write a song for Borko by the lovely Gavin & Andrea at Wetnose Animal Aid who are helping to raise funds for Borko and visiting him in June to deliver gifts that will help him to live a happier life. PRESS RELEASE 1st May 2013. Borko - The Beaten, Crippled and Abused Dog. Mr Gary Edwards from the Norton Animal Rescue Foundation, together with Michelle Jones from K9-Rescue (Bulgaria), and Gavin G Boulger from Wetnose Animal Aid are embarking on a mission to highlight the plight of Bulgarian stray dogs. Together with Celebrity Actress Lorraine Chase, Peter Fison, Director of Alchemy Filmworks Ltd, and others, they are meeting a very special dog called 'Borko'. 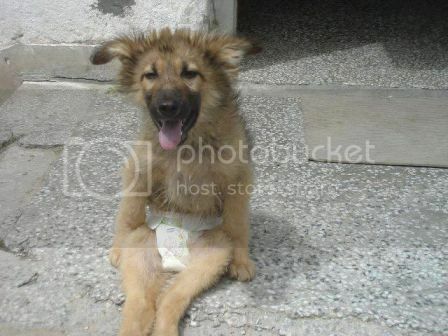 As a stray puppy, Borko was beaten so badly by villagers, that his spine was snapped, rendering him crippled for life. Dr. George Litov from Bulgaria first saw this poor stray, crying in pain as he dragged his broken body across the street, and took pity on him. Sadly, the mentality of certain people, who consider these animals as nothing more than vermin, has now resulted in a witch hunt against the doctor. Recently Borko was attacked yet again, when a local villager beat the dog with a stick, as he was sat in his front garden. The local media have declared a 'War on Strays' and therefore not only filmed this act of cruelty, but they encouraged the crowd to engage in this persecution. The local municipality have recently served Dr. Litov with eviction papers, which contradict the current animal welfare laws that exist in Bulgaria. Therefore, the above group are flying to Bulgaria in June 2013, to visit Borko and Dr Litov, and they intend to meet up with Municipal officers, and Government officials including the President of Bulgaria, to have both Dr. Litov and his dog protected, and to make a film documentary on the plight of Bulgarian strays. They are going to ask the Government to implement a National Spay-Neutering Programme for pet owners, to stop indiscriminate breeding, and to use existing animal welfare laws to protect such animals. In 2007, Bulgaria joined the European Union, and one of the criteria for its acceptance was to implement Animal Welfare laws. In 2008, Bulgaria passed its Animal Protection Act protecting animals from cruelty. Now, in 2013 and despite hundreds of cases of severe animal abuse being brought to the attention of the authorities, NO-ONE has been prosecuted. This is 2013, and a Westernised Democratic country are still acting as if it is the late 19th century. Bulgaria needs to show the world that its animal rights laws actually mean something, otherwise it makes a mockery of the freedoms and liberties that the European Union is so proud to claim it upholds. The online petition which has now amassed over 50.000 signatures is being handed to the Bulgarian Government by the above-mentioned, and the Borko Fan Page is growing every day. Many thousands of people across the World are now aware of Borko's plight, and are demanding that justice be done, not just for Borko, but for the many 'Borko's', who suffer in silence every day. Now the above group, together with the support of Celebrity actress Lorraine Chase, who is a passionate animal lover, are travelling together to Bulgaria, and they aim to change the perception of those who consider these animals to be vermin, and this publicity campaign will also involve visiting various Veterinarians, Municipal animal shelters, and others, who are battling to eradicate the many other cases of animal cruelty that exist in Bulgaria today.